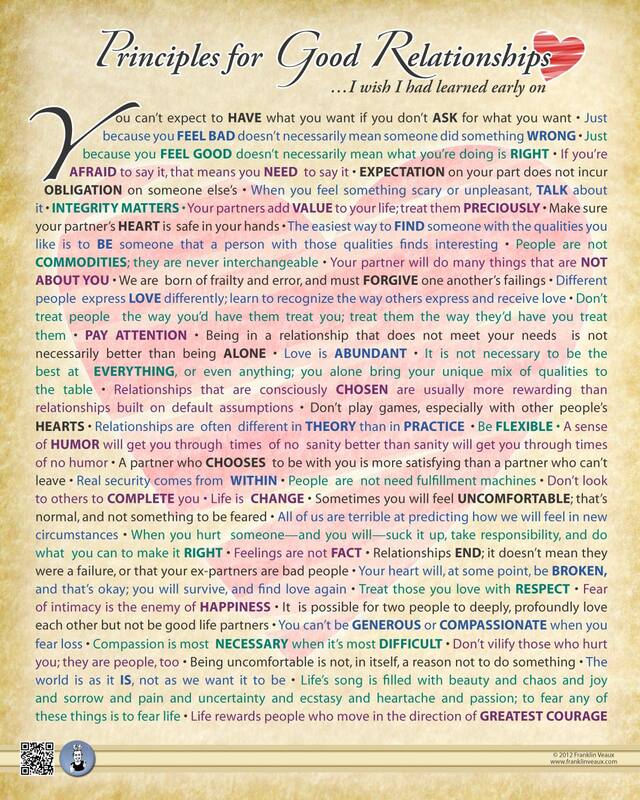 The Relationship Principles poster is a list of the ideas and values I have found that help create a solid foundation for healthy, happy relationships. The list includes such ideas as: You can’t expect to have what you want if you don’t ask for what you want. Just because you feel bad doesn’t necessarily mean someone did something wrong. Just because you feel good doesn’t necessarily mean what you’re doing is right. If you’re afraid to say it, that means you need to say it. Expectation on your part does not incur obligation on someone else’s. When you feel something scary or unpleasant, talk about it. Integrity matters. 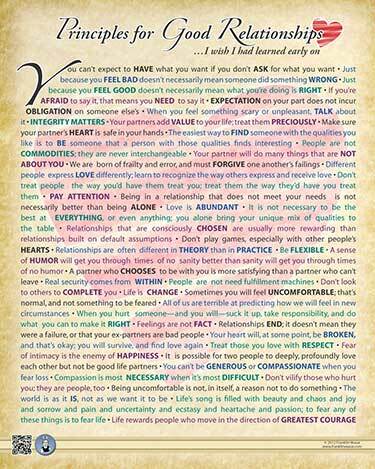 Your partners add value to your life; treat them preciously. Make sure your partner’s heart is safe in your hands. The easiest way to find someone with the qualities you like is to be someone that a person with those qualities finds interesting. People are not commodities; they are never interchangeable. Your partner will do many things that are Not About You. We are born of frailty and error, and must forgive one another’s failings. Different people express love differently; learn to recognize the way others express and receive love. Don’t treat people the way you’d have them treat you; treat them the way they’d have you treat them. Pay attention. Being in a relationship that does not meet your needs is not necessarily better than being alone. And much, much more! These are ideas I like to remind myself of regularly. You can click and drag on the picture below to scroll around the poster. The poster version is 16"x20" and printed on heavyweight semi-gloss paper. If you have a blank wall that's begging to be a conversation piece, order one yourself!